Doing things solo as a woman in India – Why the prejudice? That India is quite diverse is a known fact and with its diversity comes ample opportunities for the curious traveller. I travel solo a lot, either on vacation or on work. Occasionally I extend my work in a new city to a mini vacation by taking time off. It is during my slow travels that I think of some things back home and I wonder if the sense of freedom I seek is available to me in its true sense. 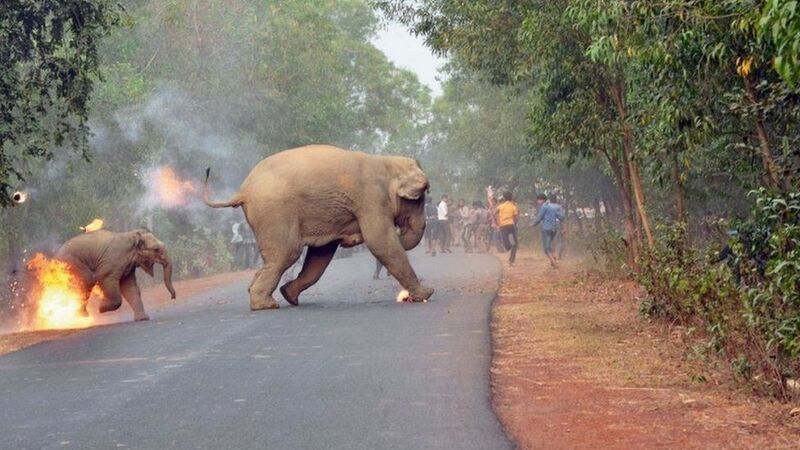 I came across the news report of this award winning photograph today and it pained me immensely to see that conflict between these gentle giants and humans continue in India. Just look at the little calf being burnt, clearly he is shouting. How can one’s heart not cry? We adore the elephant to such an extent that we worship them, heck, one of our beloved Gods has an elephant head and yet these values don’t seem to come forth when survival with the pachyderms is in question. Its raining in South India now. I am seated by my window with a piping cup of local chai, watching the rain pattering on the glass. Its a beautiful feeling. I still have a few books to read and there’s nothing that can beat the beautiful combination of hot masala chai, a great book in hand and the monsoon. The swell of the ocean brings about a now familiar November and December as the North-East Monsoon sets in. Maugham, Brunton, Hesse – the common link? When I first read Somerset Maugham’s book ‘The Razor’s Edge’ almost a decade ago, I recall to have been quite affected by it. I was perhaps enchanted by the rich prose and the style of writing. Over these years I have read a lot of books but some characters have just managed to stay in my mind, like Larry in Maugham’s book. In this era when it so much easier to purchase a book online, I decided to test how much of a hold this book would have now and I must admit that this time, it has been an overwhelming experience to read the book for reasons beyond the literature aspects. Jungles and India have had their stories intertwined for ages now. Mythical stories of demons in dense forests of India from tales over 5000 years old to valorous hunters tracking man-eaters in thickets of the these wild forests, tales in this land abound. Once what was the private hunting ground of the Maharajahs of Mysore, today the protected tiger reserve of Bandipur offers a lot of opportunities to see animals in the wild. On a weekend, we spent driving onward to the national park nestled in southern India flanked by picturesque rustic beauty of the un-urbanized India in the form of quaint villages are bustling hill stations.